What’s happening to me? Two of the last three posts have had green vegetables combined with some sort of thin pastry. Am I turning into some sort of health-food nut? Have I lost the taste for the meat of a hoofed mammal? I think not, don’t worry. To be completely up front, my mom was with me at Pegasus this night and she always wants me to eat my veggies. What could I do? 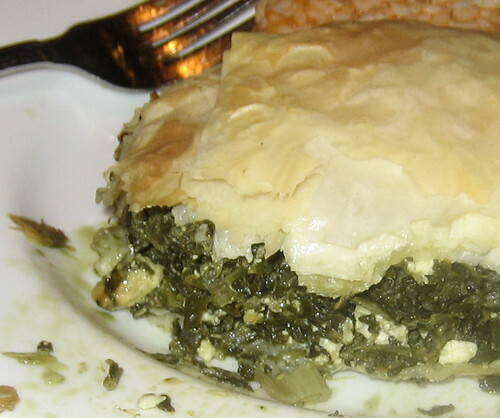 So I ordered the spanakopita. Trust me, it’s not health food by any stretch. Which is probably why it’s so good. Mixed in with the spinach is lots of feta cheese, eggs, and oil, along with plenty of seasoning. I love feta cheese and the taste is strong in this dish. It’s a ton of fun to eat. I was pleasantly surprised with the taste and texture of this green stuff. The spinach is chopped up but it still retains some it’s leafiness, which is a fine line to walk. It’s green and leafy but it cuts more like a lasagna-type of casserole. This is great because you get a serving of vegetables but it’s real easy to eat. I like the ease of eating with my hands (burgers, pizza), so sometimes it’s difficult to get my greens. I find veggies tough to eat. One of the reasons that I don’t like salads is because I hate trying to get the forkful right. You know what I’m saying? The lettuce and stuff are always hanging over the edges of the fork and you have to try to fit the whole thing into your mouth before it starts falling into your lap. I guess I could cut it up, but I don’t like to take the knife to my salad because it just doesn’t seem right. It’s like cutting spaghetti, I just don’t do it. So my relationship with the salad has never gone anywhere. I’m not going to let it get me down because I can get green veggies elsewhere, as evidenced here. As I’ve said before, I have some Greek blood in me. When I’m in Greek Town I feel like I’m amongst family. I walk in and they treat me like royalty. What a nice group of people. I wonder if non-Greeks get the same treatment. The standard Greek fare here at Pegasus is always good. Plus, they have this outdoor, rooftop deck that has a killer view of downtown. It’s perfect for a summer evening of drinking and eating. Try it the next time your at Halsted and Monroe. Posted in food on 2007/08/15 by John.